Steve Trevor and Wonder Woman spend the day watching a number of professional athletes compete in their fields and amaze at their skill. 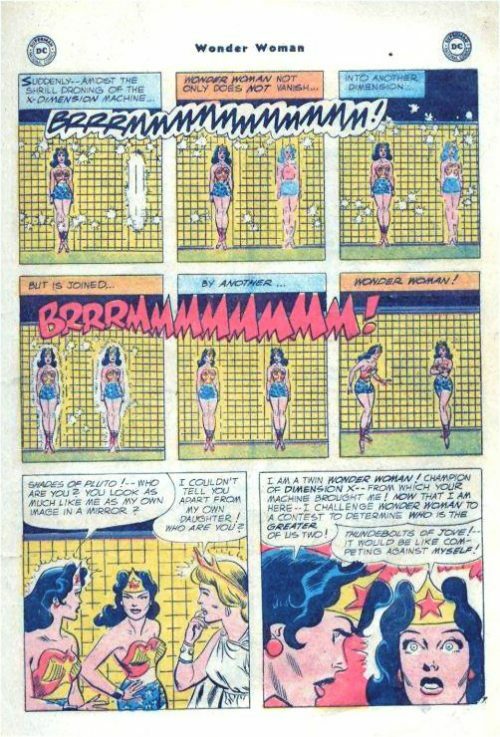 At the end of their date, Steve Trevor points out that Wonder Woman is the greatest general athlete in the world and entertains how exciting it would be to see Wonder Woman compete against herself. Wonder Woman quashes this notion, telling Steve she uses her talents for truth and justice only, not for exhibition. Just then Queen Hippolyta calls Wonder Woman back to Paradise Island. Flying her invisible jet back to her homeland, Wonder Woman learns that it now time for the annual contest to prove that she is still worthy of the title of Wonder Woman. She manages to win both challenges: racing a group of chariots by hopping in a sack, and swimming across a length of ocean against a group of motorboats, while being weighed down with a boat anchor. With the competition complete and Wonder Woman’s title secured, Diana meets with Professor Alpha in the Amazons lab. The Alpha reveals her new Dimension X transporter that can teleport people into and out of Dimension X. Wonder Woman agrees to help test it out and is transported to Dimension X. Just then she is suddenly transported back, and to the shock of everyone, with another Wonder Woman. This Wonder Woman explains that she is from Dimension X, and tells all assembled that she is far superior to her counterpart in this dimension and offers a challenge to see which one of them is truly worthy of the title Wonder Woman. A series of tests are organised to see which of the two Wonder Women was the most skilled. The first test would come to see who could remain on top of a gushing geyser. 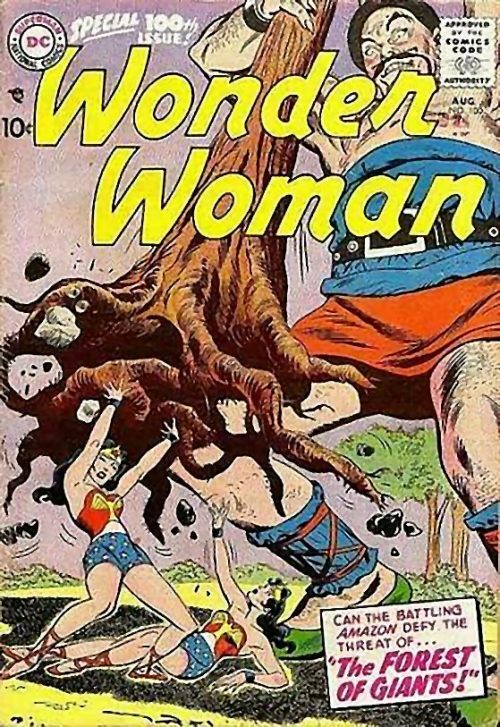 The Wonder Woman from Dimension X manages to win the competition by maintaining her balance on it’s crest while doing a hand-stand. The next competition was to see who could put out a series of giant candles out the fastest. This contest is won by Earth’s Wonder Woman, who puts out all the candles by walking on her hands. The next challenge would take place in Dimension X, and when the two transport to that world, the Wonder Woman of Earth is shocked to find that her Dimension X counterpart lives in a fairy-tale world. Before they can get to the castle where the third challenge is to take place, they are attacked by an army of giants. 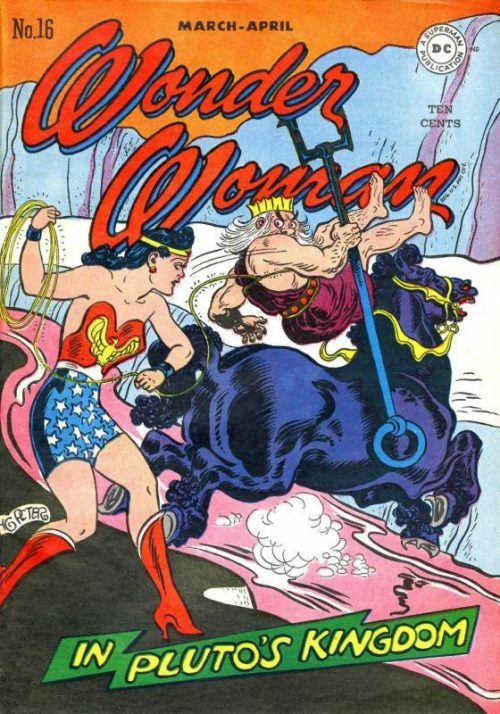 The two Wonder Women pool their abilities together to drive off this invading force of giants. However, it is Earth’s Wonder Woman who comes with a solution to defeat their foes: Uprooting a giant tree, she bends it into the shape of a boomerang and tosses it. Unprepared for such a weapon the giants are all knocked out. Thankful for her counterparts assistance the Wonder Woman of Dimension X is about to lead her Earthen counterpart to the castle when the boomerang comes back. When it threatens to strike the Dimension X Wonder Woman, Diana takes a dive and knocks it out the way. Back on Earth, Queen Hippolyta is worried about her daughters progress and Alpha turns on a view screen to see what is happening in Dimension X. 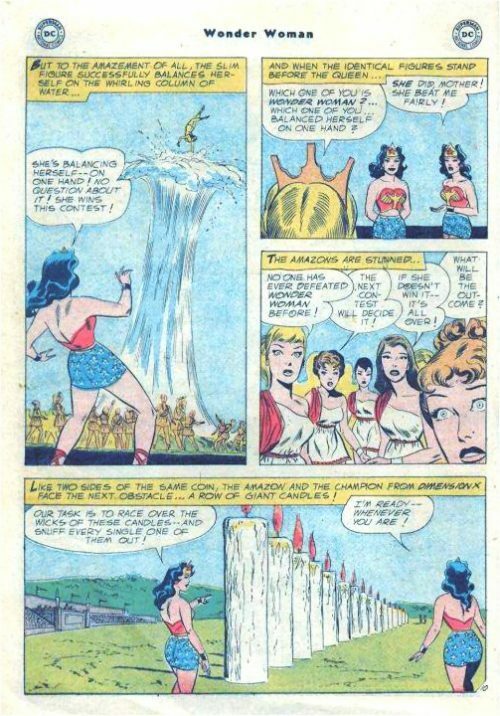 They are delighted to see a ceremony where the Wonder Woman of Dimension X is crowning Diana and proclaiming her as the true Wonder Woman of both worlds. 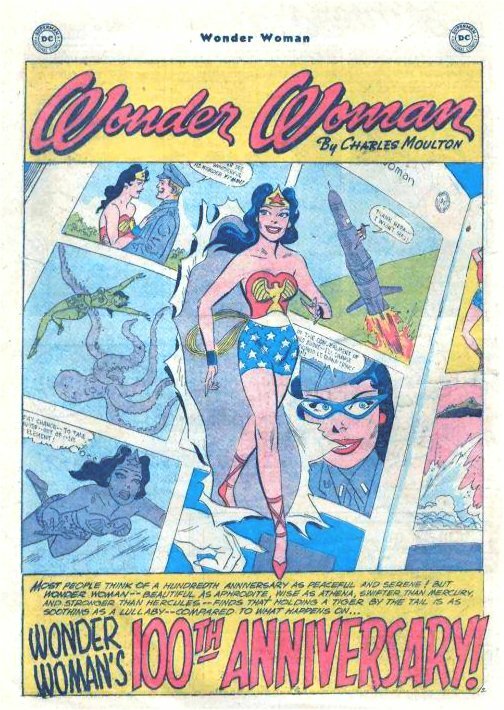 Celebrations are under way to commemorate the 100th issue of Wonder Woman’s own comic book magazine, and are preparing a time capsule as part of the festivities. 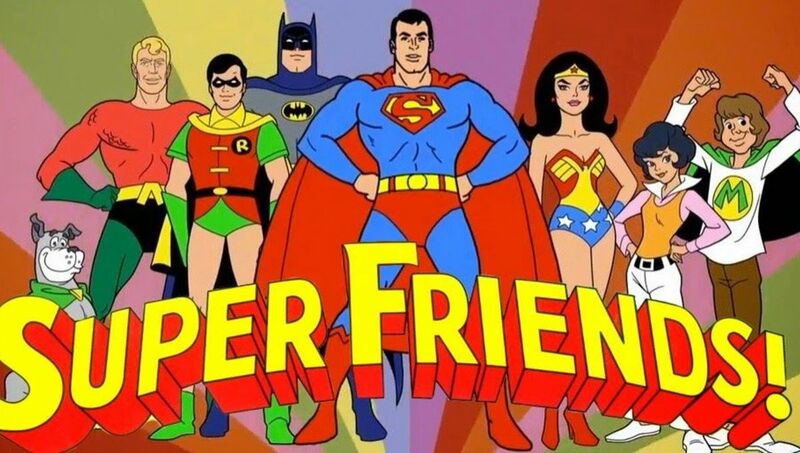 The only thing they are missing is the 100th issue that has yet to be published. When Queen Hippolyta checks the televiewer, they are surprised to see that Wonder Woman is still in her secret identity of Diana Prince. 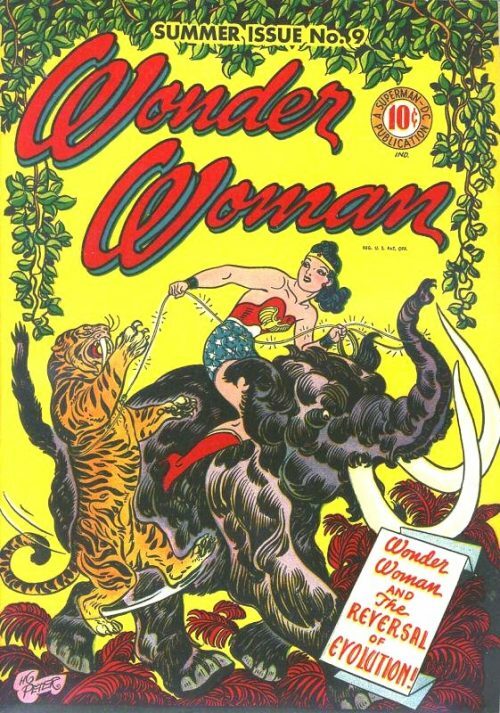 Wonder Woman is fretting over the 100th issue of her comic book because she hasn’t had any amazing adventures of late that would be fit for publishing in her comic book. Just then Steve Trevor enters Diana’s office and tells her that General Darnell has asked that they observe the test launch of a new rocket. 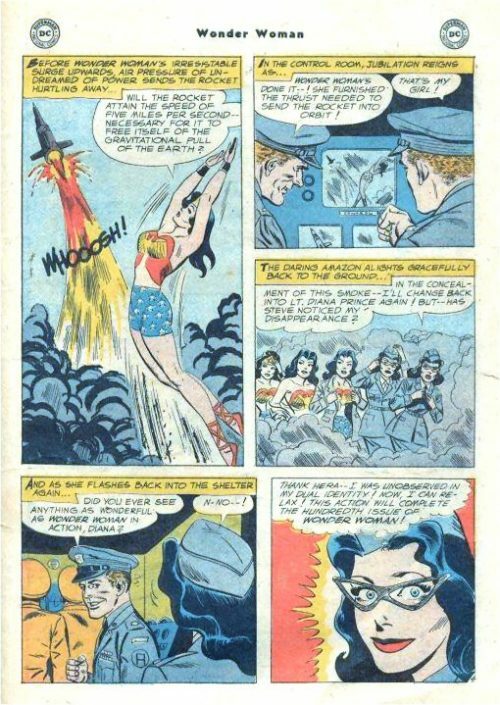 While on site, they all notice that the rocket is having trouble lifting off prompting Diana to sneak off and change into Wonder Woman to try and help the struggling rocket. She gives the rocket a helping shove that gives it enough thrust to breach the atmosphere and zips back to the launch control back in her civilian guise without jeopardising her secret identity. Wonder Woman figures that her last feat would be enough to cover her 100th story, however she gets a call from Paradise Island telling her that her last feat was unobserved due to the fact that the rockets exhaust obscured their ability to see the amazing feat. 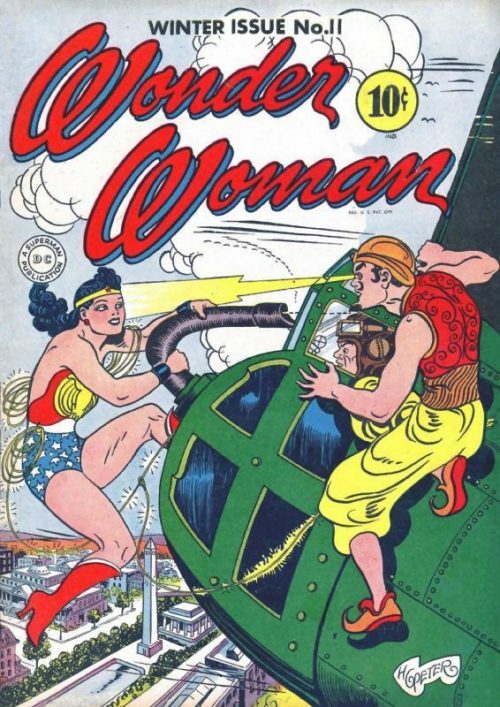 Wonder Woman is sure that she can find some feat to accomplish without Steve Trevor stumbling upon her secret identity when Steve suddenly enters the room and asks Diana to accompany him an aircraft carrier to inspect an aircraft. This puts her in a bind as she will have to be clever if she needs to change into Wonder Woman. Along the way to the aircraft carrier by motorboat, Steve and Diana spot a skin-diver in trouble. Steve dives in after the endangered soldier, but when neither surface, Diana quickly changes into Wonder Woman and dives in after them. Under the water, Wonder Woman comes across a giant octopus that is emitting an ink to obscure visibility in the ocean. 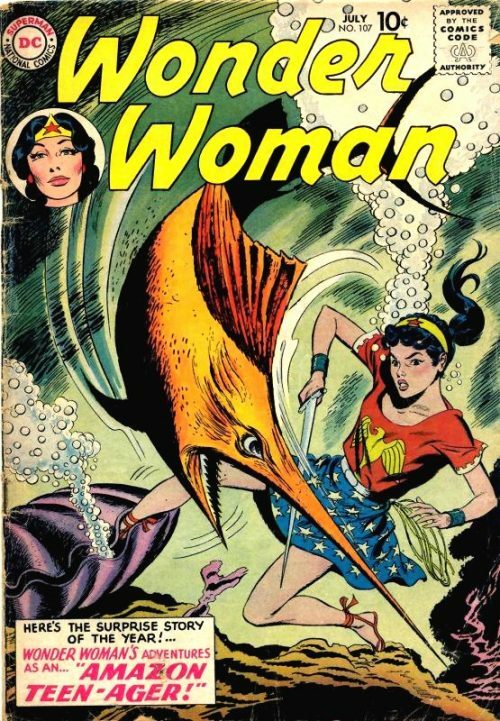 None the less, Wonder Woman manages to free Steve and the endangered skin-diver from the octopus and tosses it away and rushes off to resume her secret identity. Later when she reports back into Paradise Island, she learns that ink ejected by the octopus obscured the telescreens on Paradise Island, making her latest exploit impossible to record. With time running out, Wonder Woman returns to Paradise Island to think about what she can do next when suddenly she spots a giant tidal wave coming in, threatening to wash out Paradise Island. 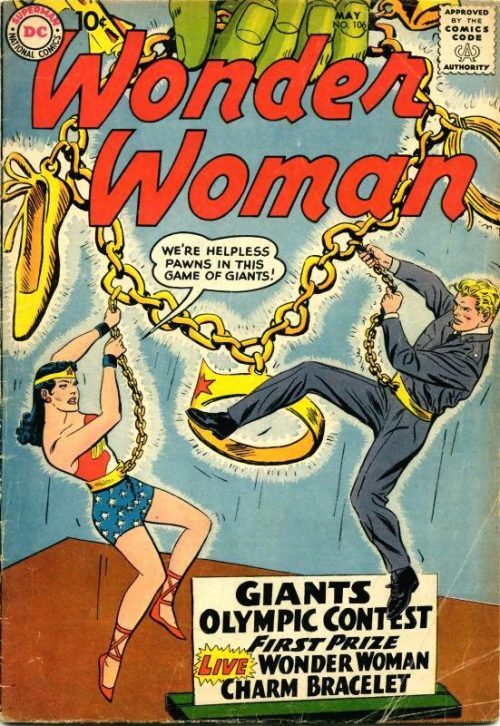 With her magic lasso, Wonder Woman ropes up the whole island and pulls it to safety. Such a spectacular feat makes headline news and makes for the perfect story for her 100th issue.